As a nation, Australia has been and continues to be in denial about the murders and massacres of our Indigenous peoples which took place in the early (and not so early) days of European colonisation. Sometimes it takes an outsider to see the truth and help us move past our blindspot. I have always felt that we could be greater than we are and the repression of the truth hampers our evolution. Australian History since colonisation has been written by the victors — by those who wrote Indigenous peoples out of the story by declaring ‘terra nullius’. But this narrative is being challenged. Most recently, by an unexpected contributor to the debate: the President of Ireland, Michael Higgins. e travelled across the nation, meeting party leaders and dignitaries. 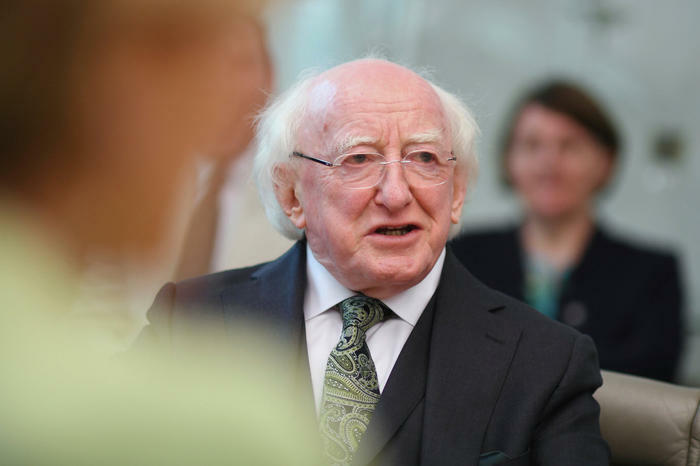 But the President of Ireland, Michael Higgins, did more than just share a few Irish tales. He reached deep into the core of Australia’s history, recognising its troubled past. President Higgins acknowledged Irish colonists’ persecution of First Nations Peoples and reminded Australians of the need to revisit their past. “If we are to be unblinking in our gaze, we must acknowledge that while most Irish immigrants experienced some measure, some a large measure of prejudice and injustice, there were some among their number who inflicted injustice too,” Mr Higgins declared at the Western Australian Parliament. The visiting head of state also cited former Prime Minister Paul Keating’s powerful speech acknowledging responsibility for crimes against Aboriginal communities. His words moved many. He especially struck a chord with Labor MP Linda Burney, Australia’s first Aboriginal woman to become a member of the House of Representatives. “It was just wonderful to hear the speech because he actually acknowledged that his Irish settlers … in the colonial period were not completely innocent when it came to the treatment of Aboriginal people. And to hear a President of Ireland, another country, acknowledge the colonial history and what that meant for Aboriginal people was incredibly heart-warming and enormously honest,” she told NITV News after the event. It is very true that it often takes an outsider for us to see within ourselves, as countries, groups, or individuals. Thanks, Kate, for shining a light on this subject. My native country (USA) has a long history of pushing this topic under the rug, too. I now live in Ecuador, where the indigenous population fought off Spanish invaders so many years ago, resulting in a population that embraces their indigenous heritage. It’s hard to accept mistakes and that too without giving any excuse. Only when you do that, you can move ahead towards corrective action and growth. Thanks for sharing this story, Kate! Kudos! Our commander-in-chief never admits mistakes and always make excuses. I like your way better. What a huge, humble step to admit error and accept it. Not many people like that anymore. Humble is the right word. I see this is very recent … Mr Michael Higgins is truly to be admired and may we all be inspired by acknowledging the/any role we have played in injustice towards aboriginal people the world over .. colonialism has much to answer too. Thanks Kate, this story needs to be shared far and wide. This is inspiration at its best; what a man! Yes, the massacre and systemized eradication of indigenous cultures is the chapter most often sought to be deleted from the histories of nations all around the world… But how can we heal, at a human level, if these atrocities are never even acknowledged? I see it in my native Mexico, and now in my adopted home of Curaçao, too. History holds terrible truths—but it is in the process of acknowledging them that we are set free. Beautiful story, Kate. Great #WATWB post! We still have so much to learn in this regard, Kate. I’m pleased to be reading this at a time when ‘Mungo Man’ was returned to his land.